Bread is relatively high in carbohydrate and calories so some people with diabetes may benefit from using alternatives to bread. Another reason for looking to alternatives is to reduce exposure to gluten which may be necessity for people with coeliac disease. If you’re looking for a bread alternative that will serve as a wrap, there are a few options. A good substitute for pita bread or tortilla wraps is lettuce. Use the large outer leaves to ensure you have a large enough area to hold the filling. Lettuce leaves are gluten free, make for a very low carb and low calorie option and help towards reaching or exceeding the 5 portions of fruit and vegetables daily target. Lettuce leaves may be more flimsy than bread or tortillas so whilst they hold a filling, they are clearly not a close match for bread in terms of taste or texture. Cabbage leaves can be also used as an alternative to lettuce. North Staffordshire oatcakes are essentially oat pancakes and not to be confused with Scottish oatcakes which are smaller and biscuit like. If you’re looking for a starchier alternative to lettuce wraps that has a lower impact of blood glucose levels than bread, then North Staffs oatcakes could be for you. Whilst wholemeal pitta bread has around 45g of carbohydrate per 100g, North Staffordshire oatcakes have 30g of carbs per 100g. North Staffs oatcakes are less heavy than pitta bread and can be rolled with a filling of your choice. Rice paper is an alternative to bread wraps but is relatively high in carbohydrate so we wouldn’t recommend using rice paper unless it is for small portions. If you are using rice paper as a wrap, it needs to be soaked in warm water first. Those of us looking for a good alternative to soft white rolls can find a good replacement in ‘Oopsie rolls’. These rolls were a chance finding by Jamie from the imaginative food website Your Lighter side. Oopsie rolls are made from 3 simple ingredients, eggs, cream cheese and cream of tartar and are therefore very low in carbohydrate, having less than 1g of carbs per roll, and are gluten free. 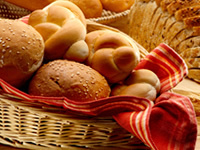 Despite having twice as much fat as bread rolls, oopsie rolls have half the calories. We’ve looked at wraps and rolls so now we’ll turn to sliced bread alternatives. Crisp bread has its origins in Scandinavia and tends to be quite rigid so is good for holding toppings and being spread onto in a similar way that toast is. If there’s a disadvantage of crisp bread, it’s that it can at times be too stiff and brittle and can snap into pieces upon biting. To get round this problem, it is possible to soften crisp bread before use. One way to soften crisp bread is to put it into a sealed box with cheese and leave out for a few hours or over night. The cheese will sweat and become greasy whilst the crispbread will soften. Rye crisp bread is a good pick as it tends to be relatively low carbohydrate and high fibre. Those looking to try their hand at cooking bread alternative can try almond bread. Almond bread is made using almond flour, which has a significantly lower carbohydrate value than wheat flour. Using eggs together with almond flour will help the bread to hold together. The finished bread will have a consistency that’s a midpoint between bread and cake. Almond bread has the advantage of being gluten free. Scottish oatcakes tend to be on the small side so are perhaps a better replacement for crackers rather than bread but are a good option if you need something relatively solid to hold a small portion. Scottish oatcakes have a satisfying texture and are less brittle than crackers. Oatcakes go well with savoury toppings such as pate, cheeses and cream cheeses but are versatile enough to go well with sweet toppings such as marmalade or bilberry jam. The smaller size of oatcakes may be useful for those looking to reduce portion sizes and with a GI rating of around 55, the rise in blood sugar will be slower than for bread. Oats are a good source of soluble fibre and their cholesterol lowering properties are well documented as well. If you’re after the real deal with bread but want to pick an option with a low carbohydrate value, look for whole grain breads. Soya and linseed and rye breads have a lower carbohydrate value per slice which can be as little as 60% the carbohydrate of some wholemeal bread slices.